Today, a patented butterbur extract known as Petadolex has been found to be effective preventative therapy for migraines, as well as chronic cough and asthma. Petadolex has been extensively studied and it has been shown to be at least as effective as current prescription drug medications in the prevention of migraines, resulting in about 60% fewer migraine attacks in about 71% of people. Once more, it has a much better safety and tolerability profile than prescription medications; the most common, but rare side effect was burping. 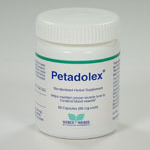 Petadolex has been used as a prescription in Germany since 1988. Typical dosing is 1 gelcap 3x/day for 4 weeks; then reducing to 1 gelcap 2x/day for 3 months.